Messerschmitt Me 262A at the National Museum of the United States Air Force. Who would have though that the world’s first operational jet fighter would start out as a tail dragger, but that’s exactly what happened with the development of the Messerschmitt Me 262 Schwalbe (Swallow). It wasn’t until the 5th prototype that a nose wheel was finally added to make it easier to get the plane airborne. In the tail dragger version it was almost impossible to get the tail up for take-off due to interference from the wing's turbulence. It was only after the pilot made a nerve wracking maneuver by tapping the brakes to tip the nose over at takeoff speed at just over 112 mph (180 km/h)1 that the plane would finally get into the air. Talk about nail biting experiences. The Me 262 wasn’t the first jet aircraft to fly. This distinction goes to the Heinkel He 178 powered by his Ernst Heinkel’s own HeS 3 turbojet engine on August 27, 1939. It was a centrifugal-flow turbojet developed by Hans Joachim Pabst von Ohain. Ohain built the first HeS 1, centrifugal-flow turbojet engine, independently and only weeks ahead of Frank Whittle who was working on the same idea in the UK. When the Heinkel He 178 made its first flight, The German Ministry of Aviation (Reichsluftfahrtministerium, or RLM) was there to witness it, but they didn’t see any practical value for the airplane. It was thought that the war was going to be short anyway, so as far as the RLM was concerned, it wasn’t something that was needed at that time. And since Ernst Heinkel was always second to Willy Messerschmitt, no contract was forthcoming. Heinkel, who was also building the He 111, continued development on his own and later developed the twin-tail He 280 jet fighter powered by the Heinkel HeS 8A turbojet centrifugal-flow engine. If a contract had been granted, the He 280 surely would have developed into a very capable jet aircraft. Meanwhile in England, Frank Whittle and his startup Power Jets Limited was finally receiving the support he needed from the Air Ministry and on May 15, 1941, the first British jet aircraft, the Gloster E.28/39, officially took to the air. In Germany however, the RLM decided in 1940 to concentrate on Projekt P.1065 involving the more advanced axial straight-flow turbojet engine. Although a straight-flow compressor would allow greater speeds than the centrifugal reverse-flow engine, the axial jet engine was much more difficult to perfect.2 The British were also experiencing problems with their axial-flow engine, the Metropolitan-Vickers F.2, which required more time to develop. This was the first Me 262 to come into Allied hands after Messerschmitt test pilot Hans Fay defected on March 30, 1945. It was subsequently lost in August 1946 after the USAAF test pilot parachuted to safety. There was a version of the Me 262 that towed a bomb on a wooden wing but, the idea was dropped as being too dangerous. On April 22, 1943, General Lieutenant Adolph Galland flew the V4 prototype (this was still the tail dragger version) and the next day Herman Göring was given a demonstration flight and he enthusiastically received the fighter. However, still no production orders were allowed. On November 26, 1943, an Me 262V6 with a fully retractable nose landing gear and improved Jumo 004 B engines was demonstrated before Hitler. Hitler now became very enthusiastic about the airplane, but to the dismay of everyone else, he envisioned it as a super-speed bomber. When approached by the Führer, Willey Messerschmitt being the trooper that he was, ensured him that the airplane could be turned into a bomber and basically told Hitler what he wanted to hear, in the hopes that idea would pass. Production on the aircraft finally proceeded, but when a production conference was held on May 23, April 1944, Hitler was told by the Secretary of State for Aviation, Erhard Milch, that the aircraft was being built exclusively as a fighter. Hitler had been pinning his hopes on using the Me 262 as a super-speed bomber as a defensive measure against the Allied invasion of France. Hitler knew that the invasion was imminent and his strategy was partly dependent on using the Me 262 to bomb invading forces.9 When told that the Me 262 would not be available as a bomber, Hitler was outraged. He forbade any mention of the airplane as a fighter and on July 8, 1944, Hitler made the famous Führer-Befehl ordering that the initial production of Me 262s be limited to bomber aircraft. This may have delayed production six months, but the crucial factor was still the engines.10 It wasn’t until November 4, 1944 that Hitler relented that the plane could be built as a fighter but he insisted that it be able to carry at least one 250 kg bomb. Armament typically consisted of four 30 mm. Mk 108 cannons mounted in the nose. The Me 262 A-1a/R1 version carried a total of twenty-four R4M rockets on the wings in its role as an interceptor and was very effective against Boeing B-17 Flying Fortresses. Four Me 262A-1a were modified to carry a single 50 mm Mk 214 cannon which extended almost 7 feet beyond the nose of the plane, but the blinding flash and smoke from the barrel limited the effectiveness of the cannon. Four Me 262A-1a were modified to carry a single 50 mm Mk 214 cannon, but smoke from the barrel limited the effectiveness of the cannon. Although faster than any other fighter, over 100 Me 262s were destroyed by P-51s and P-47s of the US 8th and 9th Air Force and 20 were destroyed by Tempests and several more by Spitfires. However, the Me 262 claimed a total of 542 Allied victories for a ratio of 5:1. On March 18, 1945, Me 262 fighter units were able, for the first time, to mount large scale attacks on Allied bomber formations. 37 Me 262s of Jagdeschwder 7 (JG 7) intercepted a force of 1,221 bombers and 632 escorting fighters. This action also marked the first use of the new R4M rockets. The high explosive warhead of only one or two of these rockets was capable of downing a B-17. They shot down 12 bombers and one fighter for the loss of three Me 262s. The Me 262's top ace was probably Hauptmann Franz Schall with 17 kills which included six four-engine bombers and ten P-51 Mustangs. Night fighter experten Oberleutnant Kurt Welter claimed 25 Mosquitos and two four-engine bombers shot down by night and two additional Mosquitos by day, while flying the Me 262. Another Me 262 experten was Oberstleutnant Heinrich Bär, who claimed 16 enemy aircraft. A total of 1,433 Me 262s were produced by the end of the war, 500 of which were destroyed by bombing raids before being completed. On August 17, 1943, the Messerschmitt plant in Regensburg was bombed by the US Eighth Air Force and some 400 employees were killed and many of the Me 262 compiled resources needed to start production were destroyed. The bombing showed that the design bureau in Augsburg was in jeopardy and the bureau was moved to Oberammergau in the Bavarian Alps delaying production several months.14 Fewer than 300 Me 262s were actually used in combat. At the end of the war, German production of the Me 262 ceased operations, but a production line of Me 262s that had been previously set up in in Prague, Czechoslovakia was restarted. Twelve aircraft were built by Avia by the Czechoslovak Air Industry in two variants. Nine were completed as the single-seat S-92 and three as the two-seat version CS-92. They were operated by the Czechoslovak Air Force until 1951. Both versions are on display at the Prague Aviation Museum in Kbely. Captured Me 262s were studied and flight tested by the Allied powers and had much influence on the designs of a number of post-war aircraft such as the North American F-86 Sabre, Republic F-84, Mig 15 and Hawker Hunter. Recently, several privately built flying reproductions were produced by the Me 262 Project. The project was started with the Texas Airplane Factory and administered by Classic Fighter Industries. • Me 262 V1 Prototype with two 1,000 lb. thrust BMW 109-003 engines and one nose mounted 700 hp Jumo 210G pistone engine with retractable tailwheel-type landing gear. The BMW engines were replaced later with two 1,850 lb. thrust Junkers Jumo 109-004A engines. • Me 262 V2 Prototype with two 1,850 thrust Junkers Jumo 109-004A engines with retractable tailwheel-type landing gear. • Me 262 V3 Prototype with two 1,850 thrust Junkers Jumo 109-004A engines with retractable tailwheel-type landing gear. • Me 262 V4 Prototype with two 1,850 thrust Junkers Jumo 109-004A engines with retractable tailwheel-type landing gear. • Me 262 V5 Prototype with two 1,850 thrust Junkers Jumo 109-004A engines with fixed nose landing gear. • Me 262 V6 Prototype with two 1,850 thrust Junkers Jumo 109-004B engines with first fully retractable nose landing gear. Nose gear became standard on all future Me 262 airplanes. • Me 262 V7 Prototype with two 1,850 thrust Junkers Jumo 109-004A engines fitted with pressure cabin. • Me 262 V8 Prototype with two 1,850 thrust Junkers Jumo 109-004A engines fitted with four 30 mm Mk 108 cannons. • Me 262 V9 Prototype with two 1,850 thrust Junkers Jumo 109-004A engines fitted with radio equipment for testing. • Me 262 V10 Prototype with two 1,850 thrust Junkers Jumo 109-004A engines fitted two underwing bomb pylons with Borsig assisted take-off rockets. 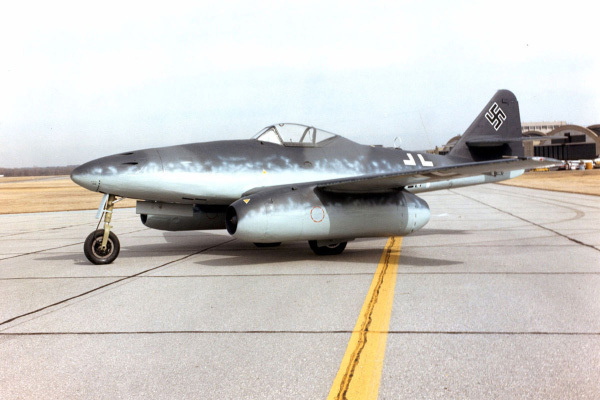 • Me 262 V12 Prototype which was specially streamlined and reached a speed of 624 mph. • Me 262A-1a Initial production Schwalbe armed with four 30 mm Mk 108 cannons in the nose. • Me 262A-1a/U1 Armed with two 20 mm MG 151/20 cannons, two 30 mm Mk 103 cannons and two 30 mm Mk 108 cannons in the nose. • Me 262A-1a/U2 Bad weather fighter, armed as 1a and fitted with FuG 220 Lichtenstein SN-2 90 MHz radar transceiver and Hirschgeweih antenna array. Only one produced. • Me 262A-1a/U3 Unarmed reconnaissance version with two vertically nose mounted Reihenbilder RB 50/30 cameras. • Me 262 A-1a/U4 Bomber destroyer version, two prototypes with an adapted 50 mm MK 214 (or BK-5) anti-tank gun in nose. • Me 262 A-1a/U5 Heavy jet fighter with six 30 mm Mk 108s in the nose. • Me 262A-1a/R1 Armed as 1a and fitted with twenty-four 55 mm R4M rockets on wooden racks. Forty airplanes were fitted with these racks near the end of the war. • Me 262A-2a Sturmvogel fighter bomber armed as 1a with 1,000 kg bomb load. • Me 262A-2a/U1 Armed as the Sturmvogel with the two top Mk 108 cannons removed to create space for the TSA bomb sight. • Me 262A-2a/U2 Featured a bulged glazed/wooden nose which housed a second crew member lying prone using a Lotfe 7H bomb sight. Only one was built. • Me 262A-3a Proposed ground attack version armed as 1a with extra armor for the fuel tanks, floor and cockpit sidewalls. • Me 262A-5a Reconnaissance fighter with two 30 mm Mk 108 cannons and two RB 50/30 vertically-mounted cameras in the nose with an observation panel in the floor of the cockpit and pylons for two 66 gal. or one 132 gal. external tanks. • Me 262B-1a Twin-seat trainer armed as 1a with internal fuel reduced and replaced with two 66 gal. or one 132 gal. external tanks. Fifteen trainers were produced. • Me 262B-1a/U1 Two-seat night fighter armed as 1a with FuG 218, 120a and FuG 350 ZC "Naxos". • Me 262B-2a Lengthened fuselage of 3 ft. 11-1/4 in. wth increased 257 gal. fuel capacity armed as 1a with two additional remote-controlled Mk 108 cannons with Schräge Musik installation with FuG 350 ZC "Naxos". • Me 262C-1a Armed as 1a with Walter HWK (109-509) rocket installed in the tail. • Me 262C-2b Armed as 1a with two 1,760 lbs. thrust BMW 003R engines combined with three minute duration, 2,700 lbs. thrust BMW 718 bi-fuel rocket motor. Only one flight test was made. • Me 262C-3 Proposed version with a jettisonable Walter rocket motor fed by a jettisonable fuel tank forward of the rocket motor, both located under the fuselage. • Me 262D Proposed version with the SG 500 Jagdfaust comprised of twelve rifled mortar barrels in the nose, pointing forward and upward. • Me 262E-1 Me 262-1a fitted with one 50 mm Mk 114 cannon in the nose. This project was abandoned as the smoke and cannon flash limited pilot visability. • Me 262E-2 Proposed version with twelve R4M rockets on each wing and 24 R4M rockets in the nose. 1. Michael Pavelec. The Jet Race and the Second World War. London: Praeger Security International, 2007. 37. 3. Jack V. Casamassa and Ralph D. Bent. Jet Aircraft Power Systems. New York: McGraw-Hill Book Company, 1957. 292-299. 4. Dr. Daniel Uziel. Jet Engine Development in Germany. November 17, 2012. 5. J.R. Smith, Antony L. Kay, E.J. Creek. German Aircraft of the Second World War. London: Putnam, 1985. 44. 6. Lt. R. M. Salter Jr. and Lt. Comdr. G. G. Emerson. Power Plant Memorandum No. 12, German Turbo-jet Development. Washington: Navy Department Bureau of Aeronautics, June 1945. 7. William Green. Famous Fighters of the Second World War. New York: Doubleday and Company, Inc., 1967. 120. 8. David Mondey. The Concise Guide to Axis Aircraft of World War II. New York: Smithmark Publishers, 1984. 186. 9. Marek J. Murawski. Messerschmitt Me 262, In Defence of the Third Reich. Lubin, Poland: Kagero, 2007. 13. 10. Anthony Pritchard. Messerschmitt. London: Vantge Books, 1975. 160. 11. Richrd Smith. Aircraft In Profile, Volume 6. The Messerschmitt Me 262. (Garden City, New York: Doubleday & Company, 1970.) 124. 12. William Green. Famous Fighters of the Second World War. New York: Doubleday and Company, Inc., 1975. 61. 14. Marek J. Murawski. 10-11. Created November 14, 2012. Updated June 20, 2015.